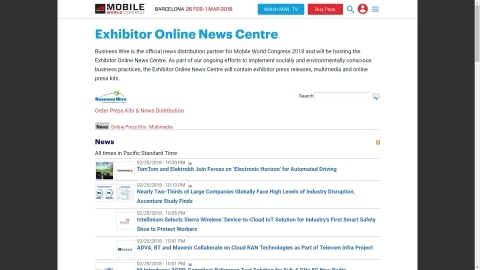 Business Wire will be making breaking Mobile World Congress 2018 exhibitor news and online press kits available through the exhibitor online news centre on the official show site at https://www.mobileworldcongress.com/attend/press/. For more information on Business Wire’s suite of event news release distribution services, visit https://tradeshow.businesswire.com/mobileworldcongress. For more information on services for media and analysts visit https://www.businesswire.com/portal/site/home/media-journalist-tools/. Founded in 1961, Business Wire is a trusted source for news organizations, journalists, investment professionals and regulatory authorities, delivering news directly into editorial systems and leading online news sources via its multi-patented NX Network. Business Wire has 29 offices worldwide to securely meet the varying needs of communications professionals and news consumers.